An older version of Kiwix on MacOS, which is no longer available for download. Kiwix is a free and open-source offline web browser created by Emmanuel Engelhart and Renaud Gaudin in 2007. It was first launched to allow offline access to Wikipedia, but has since expanded to include other projects from the Wikimedia Foundation as well as public domain texts from Project Gutenberg. Available in more than 100 languages, Kiwix has been included in several high-profile projects, from smuggling operations in North Korea and encyclopedic access in Cuba to Google Impact Challenge's recipient Bibliothèques Sans Frontières. Founder Emmanuel Engelhart sees Wikipedia as a common good, saying "The contents of Wikipedia should be available for everyone! Even without Internet access. This is why I have launched the Kiwix project." After becoming a Wikipedia editor in 2004, Emmanuel Engelhart became interested in developing offline versions of Wikipedia. A project to make a Wikipedia CD, initiated in 2003, was a trigger for the project. In 2012 Kiwix won a grant from Wikimedia France to build kiwix-plug, which was deployed to universities in eleven countries known as the Afripedia Project. In February 2013 Kiwix won SourceForge's Project of the Month award and an Open Source Award in 2015. The software is designed as an offline reader for web content. It can be used on computers without an internet connection, computers with a slow or expensive connection, or to avoid censorship. It can also be used while traveling (e.g. on a plane or train). Users first download Kiwix, then download content for offline viewing with Kiwix. Compression saves disk space and bandwidth. All of English-language Wikipedia, with pictures, fits on a USB stick (54 GB as of May 2016, or 16 GB with no pictures). All content files are compressed in ZIM format, which makes them smaller, but leaves them easy to index[disambiguation needed], search[disambiguation needed], and selectively decompress. The ZIM files are then opened with Kiwix, which looks and behaves like a web browser. Kiwix offers full text search, tabbed navigation, and the option to export articles to PDF and HTML. There is an HTTP server version called kiwix-serve; this allows a computer to host Kiwix content, and make it available to other computers on a network. The other computers see an ordinary website. Kiwix-plug is an HTTP server version for plug computers, which is often used to provide a Wi-Fi server. Kiwix uses the deprecated XULRunner Mozilla application framework localised on Translatewiki.net, but plans to replace it. Downloading new content files on an early version of Kiwix. Reading Wikipedia through Kiwix on a boat in the South Pacific. A list of content available on Kiwix is available for download, including language-specific sublists. Content can be loaded through Kiwix itself. Besides Wikipedia, content from the Wikimedia foundation such as Wikisource, Wikiquote, Wikivoyage, Wikibooks, and Wikiversity are also available for offline viewing in various different languages. In November 2014 a ZIM version of all open texts forming part of Project Gutenberg was made available. Besides public domain content, works licensed under a Creative Commons license are available for download as well. For example, offline versions of the Ubuntu wiki containing user documentation for the Ubuntu operating system, ZIM editions of TED conference talks and videos from Crash Course are available in the Kiwix archive as ZIM file formats. Kiwix can be installed on a desktop computer as a stand-alone program, installed on a tablet or smartphone, or can create its own WLAN environment from a Raspberry plug. Locations of 13 universities in 11 countries where Kiwix was deployed as part of the Afripedia Project. Universities and libraries that can't afford broadband Internet access. The Afripedia Project set up kiwix servers in French-speaking universities, some of them with no Internet access, in 11 African countries. Schools in developing countries, where access to the internet is difficult or too expensive. Installed on computers used for the One Laptop per Child project. Installed on Raspberry Pis for use in schools with no electricity in Tanzania by the Tanzania Development Trust. Installed on tablets in schools in Mali as part of the MALebooks project. Used by school teachers and university professors, as well as students, in Senegal. Deployed in Benin during teacher training seminars run by Zedaga, a Swiss NGO specialized in education. The Fondation Orange has used kiwix-serve in its own French language technological knowledge product they have deployed in Africa. A special version for the organisation SOS Children's Villages was developed, initially for developing countries, but it is also used in the developed world. Aboard ships in Antarctic waters. By the Senegalese Navy in their patrol ships. Included in Navigatrix, a Linux distribution for people on boats. On a train or plane. In European and US prison education programs. Medical Wikipedia app on a smartphone. Kiwix was formerly available in the native package managers of some Linux distributions. However, Kiwix is currently not available in most package databases, due to XULRunner, a program on which Kiwix depends, being deprecated by Mozilla and removed from the package databases. Kiwix is available in the Sugar and ArchLinux Linux distributions. It is also available on Android. Kiwix is available in the Microsoft Store, on Google Play, and Apple's iOS App Store. Since 2015, a series of "customized apps" have also been released, of which Medical Wikipedia and PhET simulations are the two largest. ^ a b c d e "Kiwix". SourceForge. Retrieved 22 March 2012. ^ "Kiwix JS". Windows Store. Microsoft. ^ a b c d Sutherland, Joe. Emmanuel Engelhart, Inventor of Kiwix: the Offline Wikipedia Browser. In: Wikimedia Blog. 12 September 2014. Accessed on 26 November 2014. ^ "The plot to free North Korea with smuggled episodes of "Friends"". Wired. Retrieved 27 April 2016. ^ "¿Cómo utilizar Kiwix como servidor local?" (in Spanish). Retrieved 3 July 2017. ^ "Les Lauréats du Google Impact Challenge". Retrieved 27 April 2016. ^ Traoré, Kardiatou. 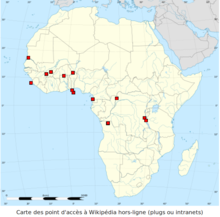 "Afripédia : un projet de promotion de Wikipédia en Afrique". www.afrik.com. Retrieved 8 March 2016. ^ a b c d e f g "Kiwix Aims to spread Wikipedia's Reach". Slashdot. 4 February 2013. Archived from the original on 2 March 2013. Retrieved 10 July 2013. ^ "OSS Awards küren Schweizer Open-Source-Projekte". Netzwoche. Retrieved 8 December 2015. ^ a b "Content in all languages - Kiwix". www.kiwix.org. Retrieved 8 August 2016. ^ "Kiwix-plug - Kiwix". www.kiwix.org. Retrieved 8 March 2016. ^ "Translating:Kiwix - translatewiki.net". translatewiki.net. Retrieved 8 March 2016. ^ "Linux Packaging project - Kiwix". www.kiwix.org. Retrieved 8 March 2016. ^ a b "Sailing the South Pacific with a copy of Wikipedia on board: The Goodall Family". Wikimedia Blog. Retrieved 8 March 2016. ^ "Content in all languages - Kiwix". www.kiwix.org. Retrieved 2017-06-09. ^ "Wikipedia Database download: English-language Wikipedia". Wikipedia. Retrieved 17 November 2017. ^ Engelhart, Emmanuel. 50.000 public domain books available to everybody, everywhere, offline. Wikisource-l-Mailinglist, Wikimedia Foundation. 19 November 2014. Accessed on 26 November 2014. ^ "Words and what not: #Wikimedia & Project #Gutenberg - the sum of all knowledge". ultimategerardm.blogspot.ch. Retrieved 8 March 2016. ^ "Main Page - Kiwix". www.kiwix.org. Retrieved 8 March 2016. ^ "Afripedia project increasing off-line access to Wikipedia in Africa". Wikimedia Blog. Retrieved 8 March 2016. ^ "(fr) ASRI Education may 2013" (in French). Asri-education.org. Retrieved 10 July 2013. ^ "Raspberry Pi in Masekelo: Bringing Wikipedia to a school without electricity". Wikimedia Blog. Retrieved 8 March 2016. ^ "Children in Mali can now read Wikipedia offline, thanks to MALebooks e-readers". Wikimedia Blog. Retrieved 8 March 2016. ^ "West African schools will test Kiwix, the offline Wikipedia reader". Wikimedia Outreach Education Newsletter. Wikimedia Foundation. 31 August 2016. Retrieved 11 June 2017. ^ "Kiwix is mentioned on the thank-you page". Zedaga (in French). Retrieved 11 June 2017. ^ Fondation Orange: le programme "écoles numériques" Archived 5 April 2015 at the Wayback Machine. ^ "Hans Oleander: Using offline Wikipedia to guide tours at the bottom of the Earth". Wikimedia Blog. Retrieved 11 June 2017. ^ "Kiwix'le Wikipedia'ya ulaşmak hala mümkün". gazetekarinca.com (in Turkish). 5 May 2017. Retrieved 8 March 2016. ^ "Navigatrix.net - A Voyager's Companion". navigatrix.net. Retrieved 8 March 2016. ^ "Navigatrix – the first Linux distribution for cruisers". Your Cruising Editor. Retrieved 8 March 2016. ^ Amarilli, Antoine. "A local copy of Wikipedia with Kiwix - a3nm's blog". a3nm.net. Retrieved 8 March 2016. ^ "Debian - Kiwix". www.kiwix.org. Retrieved 8 March 2016. ^ "Get Kiwix JS - Microsoft Store". Microsoft Store Online. Retrieved 12 February 2018. ^ "Kiwix, Wikipedia offline - Android Apps on Google Play". Google Play. Retrieved 8 March 2016. ^ "Kiwix on the App Store". App Store. Retrieved 8 March 2016. Wikimedia Commons has media related to Kiwix. This page was last edited on 10 March 2019, at 17:29 (UTC).